Sometimes the Hannity Show on Fox News contains a real verbal slug-fest between guests that has you rooting for one over the other as if it was a sporting event rather than a political discussion. Last night was one of those nights. Chris Phillips, one of the organizers of the Million Muslim March faced off with Dr. Zuhdi Jasser of American Islamic Forum for Democracy on the Hannity Show tonight. Phillips said the march is not only about supporting “victimized” Muslims in the United States, but also the innocent Muslims who have died all over the world since 9/11. Asked for an example of how America “villainizes” Muslims, Phillips asked Hannity, “aren’t you villain-izing them with this broadcast? 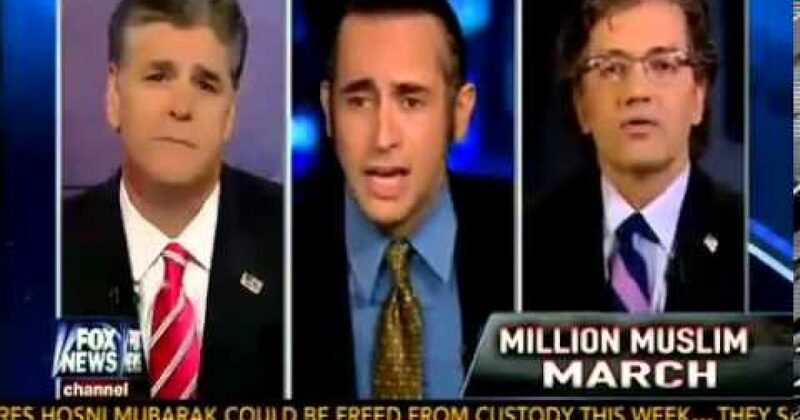 When Hannity turned the topic to the “anti-Semites” who invited to the event, like Louis Farrikhan Phillips would not answer directly whether he was against Antisemitism, only saying that “anti-Zionism and Antisemitism, are not the same thing.” He would not respond to why HAMAS was invited to the event only saying that he hoped that no one would commit violence at the event.